The waters around our island are filled with fish. You can even use your casting rod from the shores of the island as the water is relatively deep. We also have fantastic fishing spots for wild Sea Trout. The average size of the trouts is around 50 centimeters and there is always a fair chance of catching a bigger fish. The Sea Trout season stretches from April to September. After that fishing is not allowed and the spawning starts - the fishing area rests during the winter. The local museum on the island is a small house called the fisherman's cottage. Pay a visit here to get an understanding of the life of the fishermen who used to live here on the island. Around Isackesund or "the Strait of Isack" you will find the oldest houses on the island. This is where the boats docked before the main harbour and dock were built in the 1930's. 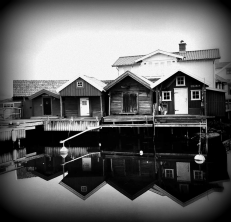 Here you can really feel the history among the old boathouses that have been here for centuries. They were built using driftwood and material from ships that sunk around the island. Equally beautiful whatever time of the year you come. The beautiful stone pier was built more than 300 years ago to protect the small harbour. 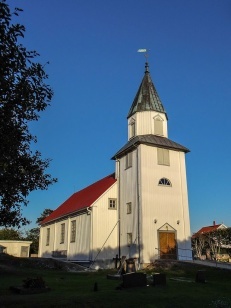 Käringön has been inhabitated since the 16th century and the church on the island was built in 1796. 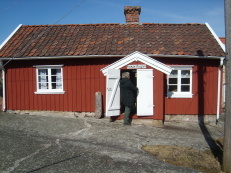 The timber for the building was transported by boat from the province of Dalsland and it was painted red. The church remained that way during the following 100 years. Today, like many other churches in the same province, the church is painted white. The church has one assembly hall for the entire parish and an altar. The church staple is 20 meters high. It can be seen from far away and is therefore a landmark on the island. Placed outside of the church are the Stone and the Anchor, as a reminder of, and a way of honoring, the islanders who lost their life at sea. Most noticeable about the church’s interior is the beautiful altarpiece from 1970, which portrays the institution of the Holy Communion. A portrait of the vicar Nils Holgersson Anctander and his family hangs to the right of the altarpiece. In the church porch there is a church chest from 1799, which today is used as a collecting box for the church’s pious people. The pilot viewpoint is located on the west part of the island. 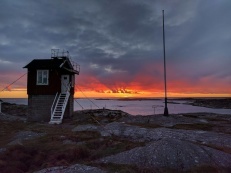 In 1960, the pilot station at Käringön was closed down and moved to Lysekil. The last remaining pilots at Käringön were Ville Bagge and Bengt Bull. Immediately west of Käringön is the island of Måseskärs with it's old and new lighthouses. The old lighthouse was built in 1865 and is 27 metres high. The lighthouse and the connected houses were very important since the waters are really dangerous because of all the small islands and under-water rocks. This part of the coastline has always been known as one of the most dangerous places for seafarers. In the middle of the 1970-ies, the old lighthouse was replaced by a modern one (to the left in the picture). You can enter the small harbour of the island by boat, but you really need to know the waters very well to do that. 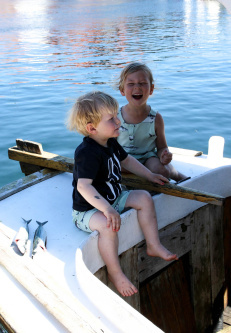 See boat trips! 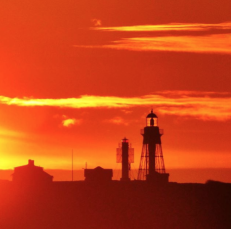 On December 7, 2017, we were reached by the happy news that Måseskär becomes a state monument (statligt byggnadsminne), which means that the lighthouse and it's houses will be maintained and preserved for generations to come financed by tax money. 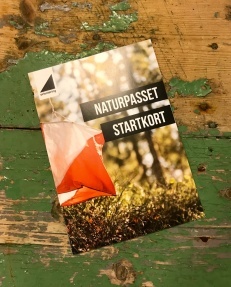 "Naturpasset" (the nature pass) is a detailed orientation map that is used for finding a number of controls located at interesting spots on the island - collect as many as you like! This is a fun and interesting way of finding your way around the island. There are plenty of small roads on the island and you can walk for hours and still not understand how they are all connected. But don't worry, you will never be lost and you will always be able to find your way back to the harbour easily. Still, we really recommend you to leave the paths and get out on the rocks to really enjoy the beauty and wilderness of the untouched nature out here. It's also good to know that there is basically no private land on the island so you can walk wherever you like - even between houses. 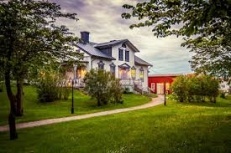 August Simson (1815-1900) and his wife Fredrika bodde used to live in the normal vicarage just north of the church, but later they built this beautiful house west of the church as their private house. The building of the house was ready in 1877.